This script will add the wow factor to your home theater and give you the true cinema experience you deserve (except you still have to supply the popcorn and drinks). It integrates with the script Apple Movie Trailers (requires an additional add-on and set-up not listed in this guide) to stream trailers directly from the web, or play locally stored trailer that are on you system. This guide is intended to be used with xbmc v10 or v10.1 and a compatible skin (Transparency!, Night, The Carmichael, Neon, Night Purity, Alaska Revisited, Backrow, Aeon MQ 2). The Transparency! skin will be used in this guide. The steps for other skins may vary, slightly. Installing one of the above skins through Confluence, the default skin. Choose and install a skin. After your skin has been installed and switched, exit out of XBMC. Download the following zip file containing the Cinema Experience add-on script. There is no need to extract the files. 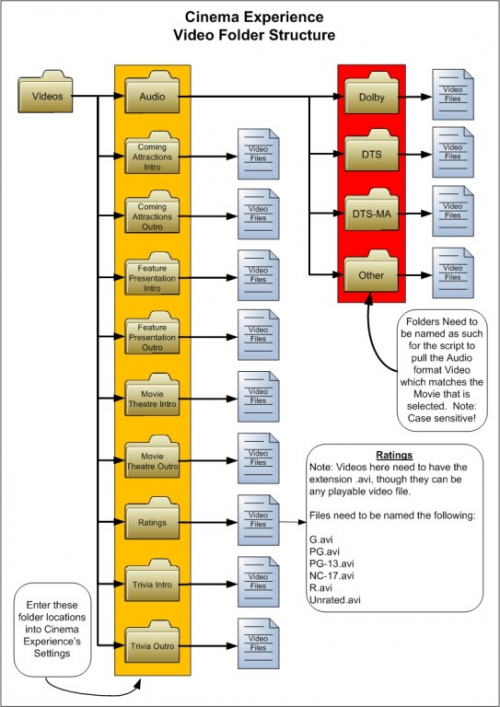 XBMC will process the zip file just the way it is downloaded. Download this zip file to use with the Cinema Experience script. Extract this file, it contains a folder and file structure, so there is no need to place the zip file in a new folder, first. There are a few read me.txt files within the structure to read for additional information regarding the area in which the read me file is located. Inside the parent folder are two folders and a read me file. Move the "Trivia" folder, and read me file into the "Videos" folder. The best place to store any extras you are using with XBMC is in the XBMC's user profiles and settings folder. The %appdata% is a hidden folder. The idea here is the XBMC folder contains all of your user settings and is the only folder that is required to be saved/moved/restored should you need to do a reinstall of XBMC and wish to have the same settings with the current scanned collection reapplied again, as long as your hard drive/network storage structure has not changed. The XBMC folder is, also, easy to get at thru XBMC's user interface. Move the repository.googlecode.xbmc-addons.zip file (just as it was downloaded, unextracted) to the "Add-on Files" folder. Move all of the folders and the read me file in the "Videos" folder, found in the second extracted zip file, to the "Cinema Experience" folder. Do not move the "Videos" folder, just the folders and the read me file that is in it. Adding the googlecode.xbmc-addons into XBMC. Do not back out of/change the menu/screen after selecting the above. Wait and you will see a confirmation notice at the top of your screen, when this process is complete. Install the Cinema Experience Script (Continued from Step 7). Wait for the confirmation notice on the top of your screen. When it is complete, back out of the Settings menus to XBMC's Home Screen (the screen you see when you start xbmc). Adding Programs Button to Home Page. Select Programs (the radio button should turn blue) and then back out of the Settings menus to XBMC's Home Screen. Select Integrate Cinema Experience in home movie menu buttons and then back out of the Settings menus to XBMC's Home Screen. This setting can be change to user preference after the trial run. The guides I used for setting up Cinema Experience are no longer available, so I have pieced together the following information from several different sites in order to get the information in one location. All of the folders moved into the "Cinema Experience" folder will match the names of each section as seen in the settings of the Cinema Experience script. Movie Ratings folder is named "Ratings" folder". There is no "Coming Attractions Outro" folder. (This is because I just select the "Advertisements" folder for that selection). Trivia section - in the Q&A folder there is a fully functioning slides.xml file that is set to rated "G". All of the Q&A files have been renamed to fit the parameters of that xml file's requirements for naming conventions. I believe the regex will work for other naming conventions -but can't confirm since I quite cheerfully borrowed it from some other more intelligent person's post (my apologies unknown Man/ Woman of Genius!). I have not tested the slides.xml with the Screenshots Quiz or Movie Quotes sections, but will update this post when I've had a chance to. Please note: I am not the I indicated in the above writings. I am unaware of any updates to the above post which I found here, posting #3, written by steppedup, Senior Member. The following image shows the required folder structure (the downloaded zip file has this structure already with the exceptions listed above). This is where you will set amongst other things, the folder locations for the intros, outros, and trivia pack. The settings shown here are used for a quick viewing of what can be done with the Cinema Experience script and the downloaded zip file containing the intros, outros, and trivia pack. You should wait and change the settings to suit your wishes after a trial run. Enable Queue Instructions - Leave this enabled (blue) for trial run. While enabled this will provide on screen instruction for Cinema Experience on the Movie Screen. The setting in Step 10 has an effect with this setting. Number Of Features - Do not use more than One (1), now, for the trial run, just to get thru it quickly. This is the Number of Movies that will be queued in the playlist for playback during the Cinema Experience. Intermission Video(s) - There are no intermission videos in the intros, outros, trivia pack zip file download. These can be downloaded and placed into the folder structure as listed above in the image. I will provide a couple of links for these files and other videos, at the end of this guide. Select OK to save settings and back out of the Programs menu to the XBMC Home page. The above settings should be good for a basic understanding of how the Cinema Experience works. Now let's start it. Select Movies from XBMC Home Page. Highlight a movie, do not select it (do not hit enter, ok, left click on it). There should be instructions at the top of the screen for Cinema Experience, enabled from Step 14. For this trial run there is only one (1) movie allowed in the queue, because of the setting for the number of Feature Presentations set in Step 14. I have never been able to get "0" to work. "Q" does work. Once "Q" is pressed on the keyboard the Cinema Experience Script will start and the highlighted movie will be the feature presentation. "Trailers" Tab>Trailers should be saved:>with the movie as moviefile-trailer.ext. Once this is done setting up Movie Trailers is much the same as the above settings. The main setting to be concerned with is listed in the next step. This is where I get out and say ya'll have at it, in that I do not collect trailers. Hey, I got ya'll this far. I am going to go out on a limb here and say: XBMC Movie Library is the trailer files in the movie folders and Local Folder is a folder containing an assortment of trailers (you'll have to set the location in Cinema Experience). Your choice, but remember XBMC uses trailer files that are in the movie folders for playback by clicking the trailer icon that appears in: the Movie Library Mode, top right of screen, or in the Movie Information Screen (found thru context menu), bottom right of screen. There was talk about adding cartoons to the script back when I first started messing with this. I don't know if it ever got done, and I did not see any thing while I was writing this guide. I just created a folder named "Cartoons," added short cartoon videos to it, and point a setting and location to the folder in the script where I wanted the cartoon/s to play. Remember the playback list for the different videos is listed above. Not all of the videos in the downloaded zip file are quality videos. You may want to go through them and delete the bad ones and/or just add more. The following links are what I used to acquire the above information. They also provide several links to additional videos, slide shows, and Q and A trivia packs to add to your Cinema Experience Collection. There is also a lot to choose from on YouTube. Did you forget the Popcorn? Cinema Experience Works Great For Out Door Movies. A simple setup with a laptop, a projector, a garage door, or the outside wall of a house will get the neighbors out of their house to see what is going on. You'll have plenty of drive bys wanting to stop and join in.